To open the Account Administration window, click the Start menu in the bottom left of the application and choose My Account from the menu options. The Account Administration window will open. The person listed at the top is the account administrator. 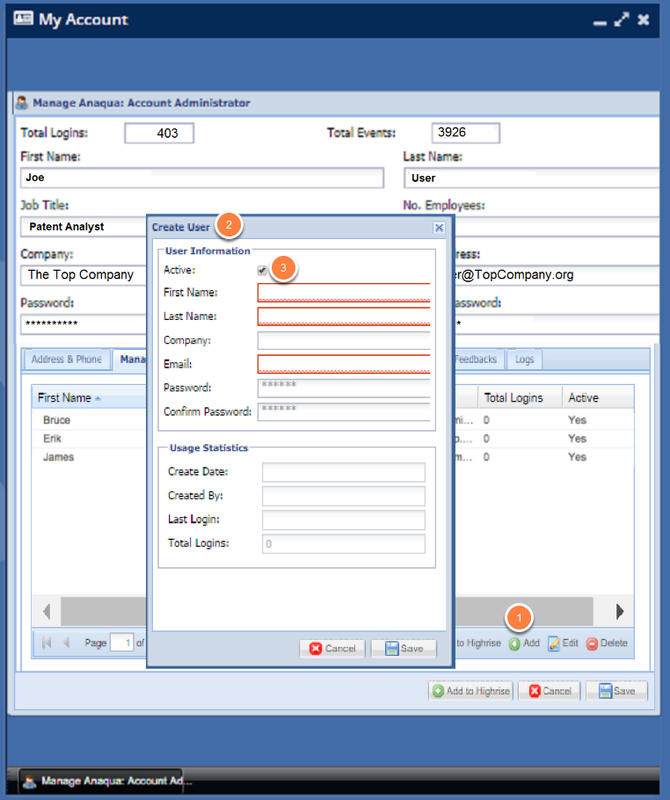 The account administrator may also have a seat and be an active user, but this is not required. If the admin is NOT also assigned to a seat, the only options they will have is to manage the account. In other words, an admin with no assigned seat will not be able to perform patent research. All administrative capabilities can be performed from this one window, including updating your address and other contact information in the Address & Phone tab, add new users to the account and make them active in the Manage Users tab, etc. Deactivate existing users (they won't be deleted, but they will no longer be active in AcclaimIP). View the number of times users have logged in. 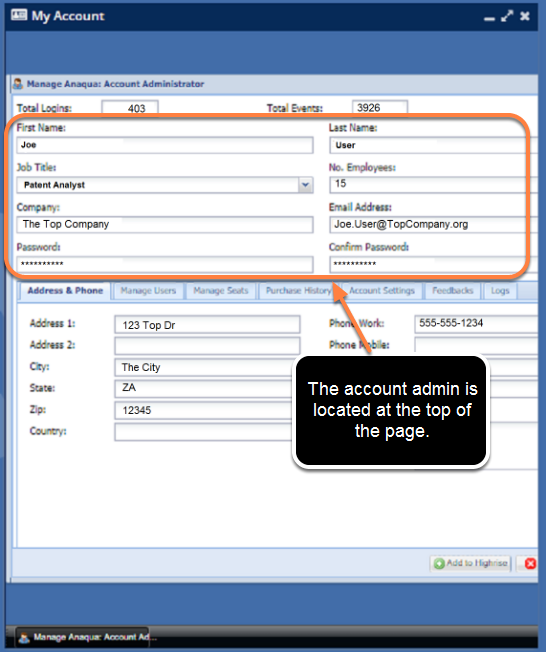 To add a user click the Add button (1) in the lower toolbar and fill out the Create User form (2). You will assign the new user a temporary password. 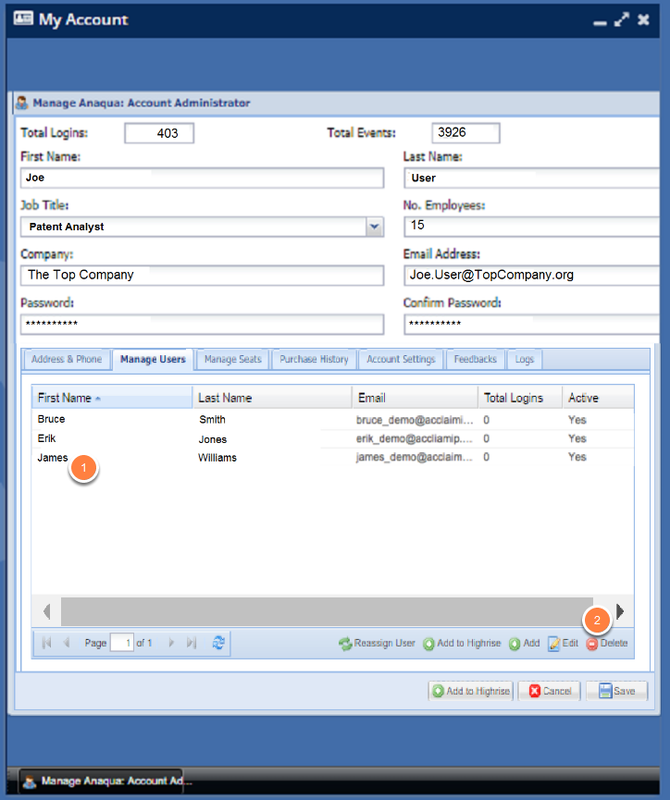 Any time an admin creates or changes a password, the user will be required automatically by the system to change their password the first/next time they log into AcclaimIP. 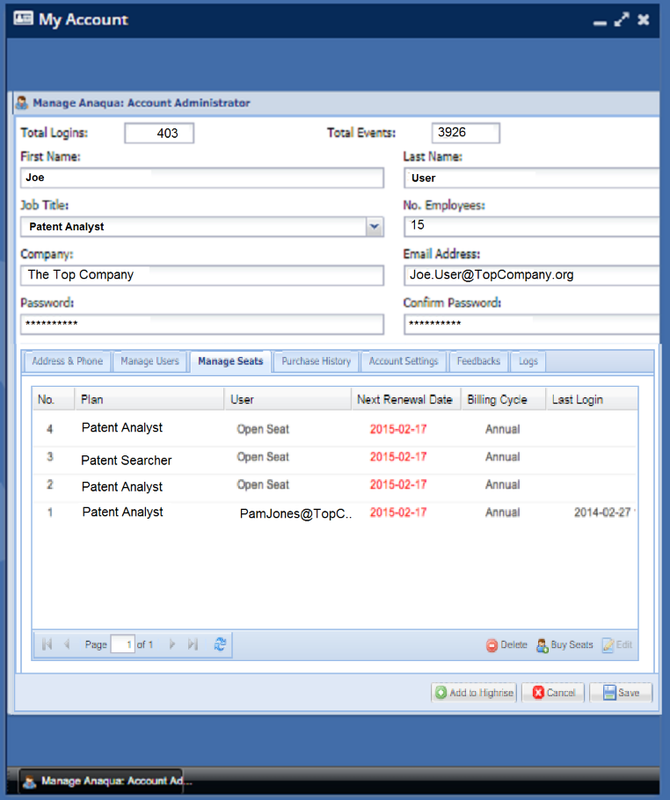 The Usage Statistics fields will be filled in automatically by AcclaimIP. The admin cannot edit these fields. The Active check box (3) will be checked by default. Un-check this box if you want to create a user but don't want the user to be active yet. Click the Save button (4) and the user will be added to AcclaimIP. While the new user is added, he or she will NOT be able to log in to AcclaimIP yet. The user must first be assigned to a Seat before they can log in. 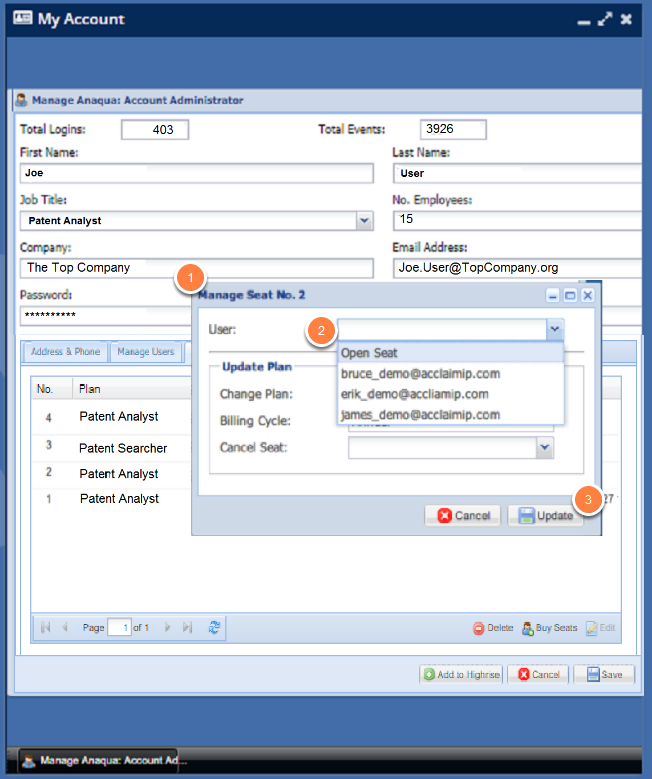 Now that you have added a new user, you can assign them to a seat so they can log in to AcclaimIP. 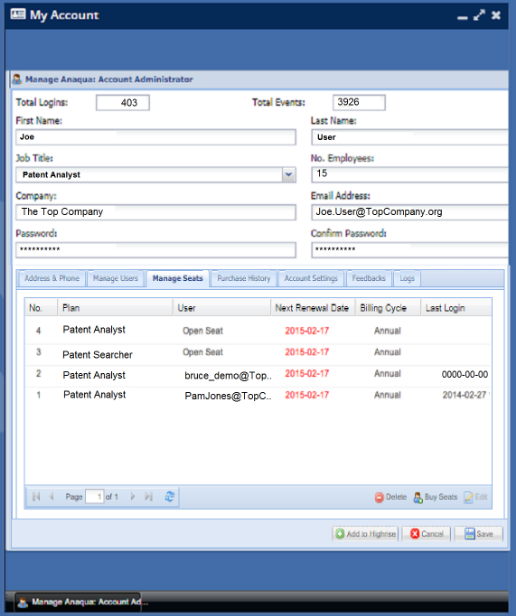 Click the Manage Seats tab, and you will see all the active seats for your account. In this case, I have 4 seats total, one Patent Searcher and three Patent Analyst seats. Only the user with the email PamJones@TopCompany.zzz is currently assigned to a seat. Let's assign somebody to one of the open Patent Analyst seats. Double-click one of the open seats, and a window will open called Manage Seat No. "N" (1). Click the drop-down menu in the User field (2) and users not currently assigned to a seat will appear. Select a user from the list and click the Update button (3). Note, the Update button which will change to Switch User once you've select a user. Bruce is now assigned to the Patent Analyst seat number 2 and can now log into AcclaimIP. Note: The next renewal date in this example is in red. This means that the seat will be automatically cancelled at the next renewal date. To switch users from one plan type to another, you first open the seat and remove the existing user by choosing Open Seat (1) from the options. Click the Switch User button to complete (remember that the Update button will become the Switch User button once a user is selected, including the Open Seat option). Now the seat will be available for the next user. Remember that the drop-down menu only displays users who are not currently assigned to a seat. In this example, if I wanted to put Bruce on the Patent Searcher seat, I would also have to remove him from his current Patent Analyst seat. To delete a user, single click the user (1) to highlight them, and then click the Delete (2) button. The deleted user will appear in red. This is an indication that they are deleted, but NOT completely removed from the system (you won't be able to see them once they are completely removed from the system). It is a safety step to make sure that users are not accidentally deleted since potentially thousands of hours of saved work could be lost. To un-delete a user, double-click the user and click the Undelete button from the Manage User Window's toolbar. To completely remove users from AcclaimIP, delete them first (the steps above to turn them red), and then contact your AcclaimIP representative with the user email address you want to completely remove from the system. We will permanently delete them for you.